On Thursday, December 8th, 2016 took place in Beauvechain airbase the remission of command of the Air Competence Center (CC AIR) of the Belgian Air Component. The ceremony was placed under the authority of General Marc COMPERNOL (CHOD), in the presence of General-Major Aviator Frederik VANSINA (Commander of the Air Component) and numerous personalities, both civilian and military. As an introduction to the military parade, the assembly attended a particularly didactic presentation by Nathalie PATTYN (Doctor Major and professor at the Royal Military Academy and at the University of Brussels - ULB / VUB) entitled "human performance in flight training". She detailed the academic knowledge on the subject as well as the results of the research carried out by the various scientific institutions in collaboration with the pilots of the Belgian Defense. The results of past research and the development of future programs make it possible to better understand the difficulties and limitations of pilot training (in flight, in space, in weightlessness), a matter that is particularly important for CC AIR trainees and trainers. Then, the procedure for the handing over of command was carried out according to the usual protocol, during which Colonel Aviator Frédéric GIVRON (commander of the CC AIR) gave a speech retracing the last three years spent in this function, underlying the importance of training in a weapon as complex as the air component, the need for state-of-the-art instructors, the complexity of having the best coaching and training procedures, and the quality requirement and search for excellence. It is a very multidisciplinary matter which requires for the command a strong discipline to promote the training in the interest of the trainees in charge; he therefore transmits the charge to his successor in order to pursue the search for excellence in order to apply the motto of the Center "studio loboreque competentiam" as best as he can - "to reach competence through study and work". Colonel Aviator GIVRON then reviewed the troops one last time while greeting his collaborators of the last three years with obviously much emotion. General-Major Aviator Frederik VANSINA then presented the new Commander of CC AIR to the staff of the Center, in the person of Colonel aviator Patrick GOOSSENS. The transfer of power was followed by a very nice reception. We are particularly grateful to Colonel GIVRON for his kind invitation and wish him every success in pursuing his career. Born in 1968, after an experience with the Air Cadets of Belgium, he joins the Air Force in 1987 in promotion 87A "F/Lt Eugene SEGHERS - DFC" and obtains his wings in June 1989 after his training on Marchetti and Alphajet. He begins his career at 349 Sqn, taking part in the TLP (tactical leadership program) and FWIT (fighter weapon instructor training), obtaining all the qualifications of force lead and instructor on F16. Admitted as a career officer in 1996 he moves to 10Wing and participates in several operations including the Allied Force in 1999. He continues his training for senior officers at the IRSD and is assigned to 2Wing at the 350 Sqn participating in the training of pilots on F16 MLU. He then collaborates on the evaluation and testing of the new M3 and M4 versions of the F16 MLU before joining the Senior Staff Course in 2007 and being assigned to the Staff Crisis Response Planning Unit. In 2010 he is designated CO of the 31 Sqn (10Wing), commands the Belgian detachment on Kandahar airbase and reaches the 3000 flying hours on F16 fighter plane. In 2012, he commands the Plans and Evaluations Division at Comopsair; then, appointed Colonel, he becomes CO of the CC AIR in September 2013. Born in 1965, he obtains a master's degree in business economics from the KU Leuven, joins the Air Force in promotion 87B "F/Lt François VENESOEN - DFC" and obtains his wings in February 1990. He is assigned to the 350 Sqn in Beauvechain airbase and trains to be Force Leader and Weapon Instructor (FWIT). In 1998 he is operations officer in Belgium for Operation Deliberate Guard (Balkans) and then, in 1999, preparatory officer for Operation Allied Force. He then moves on to the Staff Operations Evaluation Center and also participates in Joint Falcon and Joint Guardian operations. Admitted into the career officers he attends the senior officer course at the IRSD in 2000. In 2001, he returns to the 350 Sqn and then becomes Ops & Trg of 2Wing in 2002. He is qualified as a NATO assessor. In 2003 he joins the ACOS Ops & Trg Concept and Plan Division at Comopsair. In 2005, he participates in ISAF VII and then is CO of the BEL/PRT C130 detachment in Kabul. He attends staff courses and is appointed CO of the 1 Sqn (2Wing) in 2006. He returns to Comopsair in 2008 to the Fighter Operations section and then in the Operations Division. During this function he operates as red card holder within the ISAF in Kabul in support of the F16 operating in Afghanistan. In 2011 he is named OSN at 10Wing where he reaches the 2500 hours and 20 years of flying on F16. In 2013 it passes to the General Department Human Resources, is deployed to the CAOC in Qatar and participates in the organization of operations Guardian Falcon and Desert Falcon against Daech over Iraq. He is appointed Colonel in June 2016 and now CO of the CC AIR on December 8th, 2016. 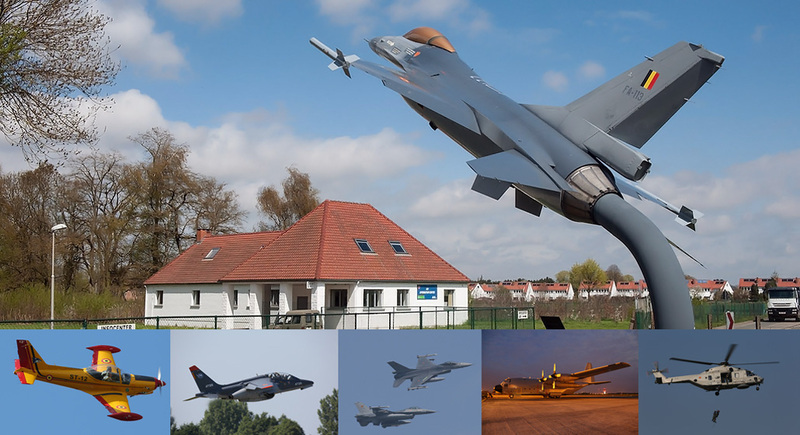 Based on the Beauvechain airbase, it is the professional training organization specialized in the formation of personnel for the Belgian Air Component, flying or not, beginner or experienced as necessary for the smooth running of its missions. Some training is provided by "home" instructors at the Center or by external instructors. Other trainings are organized in Comopsair units for non-pilot aircrew (1Wing, 15Wing and BKoks), weather forecasters (Meteo Wing), air traffic controllers (ATCC and CRC) and UAV operators (80 UAVs Sqn). Finally, CC AIR is also the hierarchical authority for the training of belgian pilots in France (fighters in Cazaux, transport in Avord and helicopters in Dax) and at Sheppard (Texas).